Guaranteed google rankings with eMagic SEO™ Services. Be found by more customers in Auckland customers searching for what you offer and profit. Results Driven SEO Auckland Company. Get your business on the first page of Google. eMagic is an Auckland SEO agency who specialise in getting more customers to your website by maximising your visibility within the search engines. We work with ambitious Auckland businesses that want to attract more local customers and become leaders in their industry online. We’ve spent years researching, testing and developing our unique eMagic™ Search Engine Strategy. If you want long term, sky-high visibility in the organic search results – you’ve come to the right place. They say the best place to hide a dead body is on page 2 of Google. If your Auckland business isn't on page one you might as well not exist. We make it easy for your customers to find you and bury your competition. Rankings are nothing but a vanity metric and are pointless unless they are turning into dollars. We make sure you target the right searches that will convert into real leads and revenue for your business. Driving the right visitors to your website who are looking for exactly what you provide makes sales simple. SEO leads have a 14.6% close rate compared to outbound leads which have a 1.4% close rate. We combine the best targeting and SEO strategies with scientific conversion rate optimisation to convert a great number of visitors into leads and sales, so you get the best return and maximise profits. Want to be found by more Auckland customers? Get in touch to find out how we can help. eMagic Are Search Engine Optimisation Experts. We’re not a jack-of-all-trades master of none type business. You won’t find us stretching ourselves across multiple disciplines – web design, email marketing, social etc and providing half-pie results. We stick to what we’re brilliant at – search engine optimisation, and we do it really, really well. Best of all we don’t waste your time or risk your hard earned money on promises. Instead, we guarantee results! Our risk-free offer guarantees first page Google rankings within 90-days or we’ll work for free. No hype, no excuses, just real guaranteed results you can take to the bank. We don't do cookie cutter search engine optimisation campaigns. Everything we do is tailored specifically to achieving your Auckland business goals and delivering you the best possible return. We are crazy about data and we use it to inform your ongoing SEO strategy to ensure you are always getting the best results possible and staying ahead of the curve. We only use proven, time tested SEO strategies that deliver long-term sustainable results. These are all industry best practice and deliver industry-leading results. We report on the things that really matter to your business like leads and sales. You can quickly see how the SEO is performing and the return you are generating on every dollar invested. Hundreds of Auckland clients are glad they choose eMagic SEO. All Spartan Combat Equipment products are sold 100% online. We needed help to improve our visibility both in local and offshore markets. Their expertise and immediate action has boosted our reach into our markets and resulted in increased sales. Their commitment to ongoing strategies to maintain our online success brings me great peace of mind. I recommend their services if you want someone you can trust…provided you are not our competitor. eMagic exceeded all our expectations! Their optimisation work was absolutely instrumental in ensuring the success of our business online. My company has had a very noticeable positive growth in organic traffic and rankings (first page rankings for all our main search terms) and we continue to see a growth in sales. Since we are a small business, we rely on cost-effective marketing/advertising and eMagic proved that first class results at an affordable price are possible! Want to be found by more customers? Get in touch to find out how we can help. We’ve Helped Over 200 Brands Succeed Online. Most digital or web design agencies that say they provide Auckland SEO services are only able to provide part of the solution. This usually starts and stops with basic on-site optimisation where results will be mediocre at best. eMagic are SEO warriors who live and breathe search engine optimisation every day (it’s all we do and we excel at it). 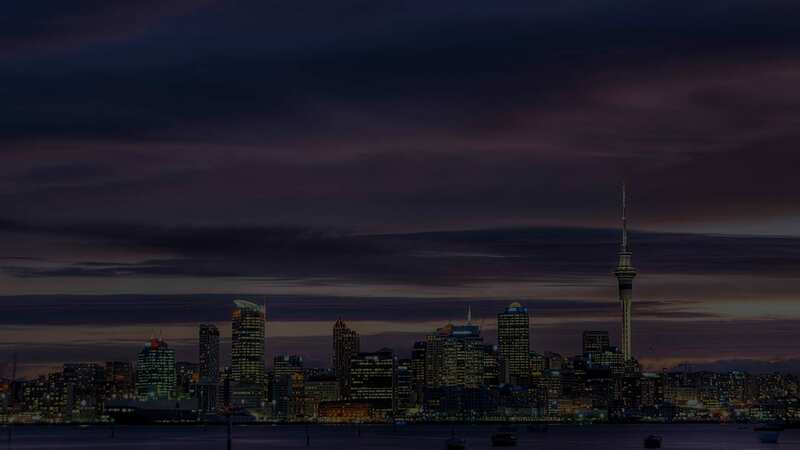 As the most effective SEO Auckland company we are able to provide comprehensive services that generate industry-leading results and help the businesses we work dominate their competition and skyrocket their rankings and profits. We’ve worked hard to bring you an SEO service that delivers you real results and doesn’t compromise on quality or value. We wanted to make sure that it was perfect for your needs and your situation as a small-medium business. Now you can take advantage of the best SEO Auckland services around from a truly expert SEO company, designed specifically for you. Discover and target high converting, buyer-focused keywords and make sure your Auckland business is found when potential customers search for these. Fix all on-site and technical issues stopping your website from dominating the search results and give your website the best chance for success. Be found in local searches and maps results and drive more Auckland customers to your business and become the top dog in your area. Effectively optimise your online store to make sure customers searching for your products can easily find them and boost your qualified traffic, sales and revenue. Uncover the exact strategies your competitors are using and identify weaknesses you can use to outsmart and dominate them in your market. Increase your linkability through awesome content and strategic outreach and watch your rankings soar. Become the authority in your online market. Craft an SEO strategy for your business that delivers the exact outcomes you want. Understand your market and drive them to your website. Ongoing consulting that gives you access to the best SEO specialists in Auckland. Get an unfair advantage and work with the best in the industry. 94% Of Kiwis Search Online Before Making A Purchase. Are you still throwing hundreds or even thousands of dollars at Google AdWords each month only to be getting a lousy return (or no return at all)? We all know that the first thing you or I usually do when we want to find out about a product or service we’re interested in is Google it. It’s exactly what your customers are doing to find you. But what if you are only relying on AdWords and neglecting other local search strategies like organic search and Google Maps? Then you are likely missing out on most of the business and leaving money on the table for your competition to collect. As PPC costs continue to skyrocket (117% in the past year according to a 2018 study by AdStage) and competition increases the only thing increasing is that hole in your pocket and not your bottom line like it should be! Click-through rate studies (compete.com 2014) have shown that only 15% of clicks go to the paid results. So, if you’re relying solely on Google AdWords for your business, then you are missing out on 85% of potential business going through Google (that’s most of it, Yikes!). This FREE Report reveals the most powerful SEO strategies guaranteed to boost your organic rankings within 30 days. Get an unfair advantage over your competition! Be found by more Auckland customers. Get more of the right website traffic, leads and sales with eMagic. We're eMagic, an SEO company passionate about helping awesome brands be found and succeed online. Local Kiwi team. We don't outsource. We have a proven track-record. 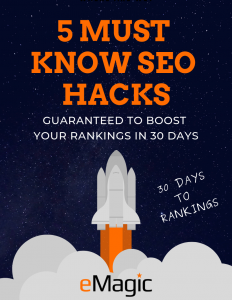 GET THESE 5 SEO HACKS TO BOOST YOUR RANKINGS IN 30 DAYS BEFORE YOU GO.